The desire for a more powerful document search and the need for document tagging and annotation abilities were the primary reasons that the RGA team wanted to switch to Sentieo. Prior to Sentieo, they were using Bloomberg. They have since removed a Bloomberg license, as Sentieo has rendered it redundant. Jason’s partner Elliot found Sentieo through recommendations from like-minded investors discussing investments on Twitter. Sentieo’s powerful document search functionality was particularly appealing, along with the Sentieo Notebook highlighting and note-taking capabilities. 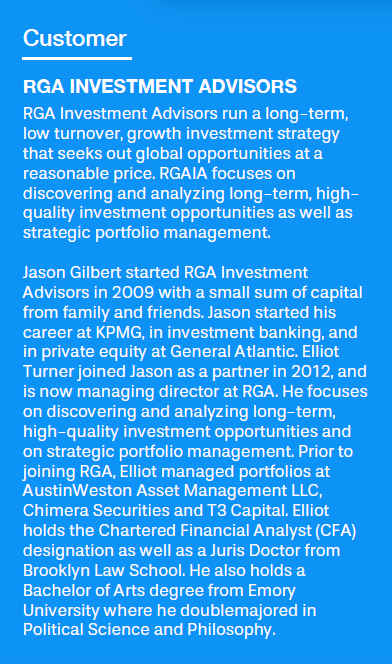 Jason wakes up around 5:30 am and starts the day reading through a vast array of morning digest emails and the WSJ via his iPad. Afterward, he logs into Sentieo to check his followed tickers and peruse any news that he may have missed. During earnings season, he’ll generally spend more time in Sentieo Document Search looking through earnings transcripts. If he sees that Elliot has already annotated a given transcript, he’ll generally access it through the Sentieo Notebook and use Elliot’s highlights as a guide. When screening for ideas or after being recently introduced to a stock, Elliot reads the most recent filings and 10-K, highlighting and annotating along the way. He runs document searches for key terms of interest and gathers some historical context. When building models, he uses Sentieo to extract tables directly from the 10-Q and 10-Ks. Like Jason’s, a good chunk of Elliot’s day is spent reading and marking up transcripts in Sentieo during earnings season and conference season. Jason and Elliot find themselves using Sentieo’s Document Search, Notebook, Watchlists, Alerts, and Equity Data Terminal the most frequently throughout their workdays. Elliot’s favorite feature is Document Search because it’s “so simple and easy to use and invaluable in numerous contexts.” Document Search and the Notebook are “without a doubt” Jason’s favorite features. They both run keyword searches multiple times a day. Elliot’s favorite feature is Document Search because it’s “so simple and easy to use and invaluable in numerous contexts.” Document Search and the Notebook are “without a doubt” Jason’s favorite features. They both run keyword searches multiple times a day. The team uses watchlists to track the companies tickers that interest them, opting into “crucial” email alerts for new documents and price news. They also heavily use Sentieo’s redlining comparison tool regularly during big filing seasons, and especially on 10-K’s. Jason and Elliot use the team note-sharing and collaboration features within the Notebook to share ideas and keep each other up-to-date. Elliot’s second favorite Sentieo feature is highlighting because “it’s fantastic to have all my markings stored in one place, neatly.” They both use document highlighting and annotation tools multiple times a day. Jason uses the Sentieo Equity Data Terminal multiple times a day to check company summary pages, which display everything from the company description to valuation and price targets, historical charts, estimates, and much more. 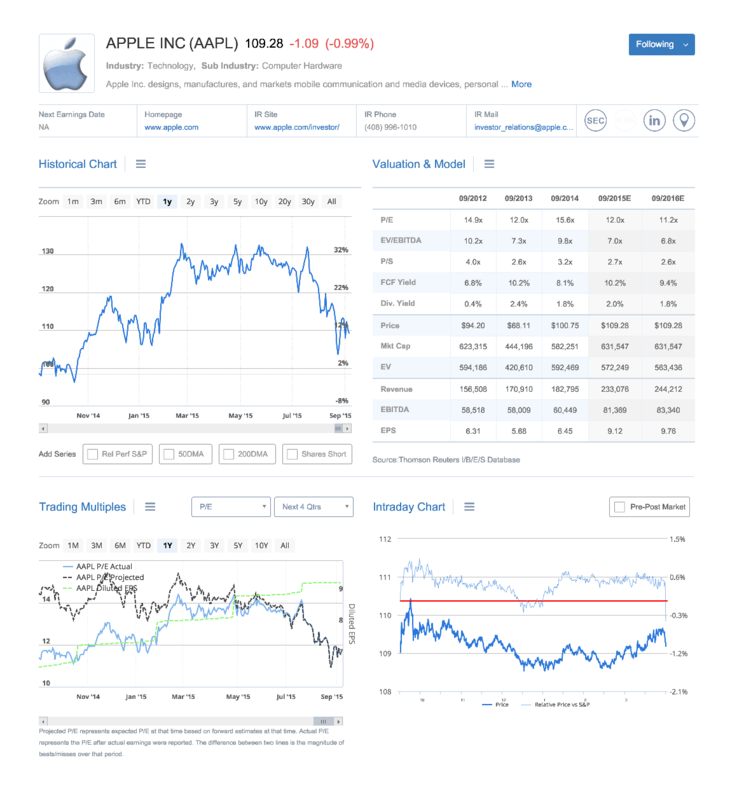 Jason uses the iPhone app often, mainly for staying updated on his followed tickers. Download this customer story as a PDF here.